Erik Brynjolfsson hasn’t been blogging too often because over the last couple of months he has been book writing. 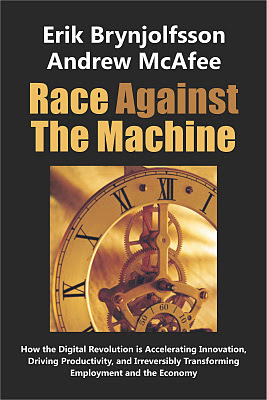 He and Andrew McAfee have released their new book, Race Against the Machine: How the Digital Revolution is Accelerating Innovation, Driving Productivity, and Irreversibly Transforming Employment and the Economy. If you think that is a wordy title, you should also understand that by the time you have read it, you are a fair way through the book. Because this is one of the new digital books — the short book. It’s about 50 or 60 pages or in Amazon units only 1,152 pages. And it has a price to match, $3.99. The New York Times featured the book today and as a consequence it is currently sitting happily at 60 in Amazon Kindle sales rank. That makes the book a hit; especially for a day where the tech book space is crowded with Steve Jobs’ biography. The main thesis of the book is that automation is speeding up and this is having an impact on employment. And not a happy one for many people. Indeed, this book itself — made possible by digitisation — has surely reduced editorial jobs and eliminated printing and distribution. But my interest here is on this new format for scholarship. Shorter books are easier for authors but also more enticing for readers. Faced with a 600 word tome, it is refreshing to spend a little on a book and also know you aren’t committing too much to find out what the author’s have to say. Shorter books are precisely what one should expect when attention is at a premium. Tyler Cowen, of course, famously led the way with this new genre in economics with The Great Stagnation, published earlier this year; itself a bestseller. It started at $4.99 and then dropped in price by a $1 before actually getting a print release. Of course, it is a lengthy 128 pages when spread out with a slightly larger than normal font. Ryan Avent took it further with The Gated City, clocking in at 90 pages but priced at an attractive $1.99. These experiments have opened up a new category and in the process may actually lead to more writing. Sadly, they can’t read to more reading as I suspect consumer attention is the scarce resource. But it may lead to more diverse reading. Shorter comments are appreciated too.